Spider-Man art | That Belongs in a Museum! One time grandma Marx was visiting, and she noticed I was thumbing through some comic books. She said, ‘You like comics?’ I said, ‘Yeah.’ ‘You like Spider-Man?’ ‘Yeah!’ She’s like, ‘Well, my lady friend, Mrs. Romeda, she’s John Romeda’s mother.’ ‘Really? !’ ‘Yeah.’ […] John Romeda is the guy who from 1966 to about 1980 was the artist for Spider-Man at Marvel Comics. 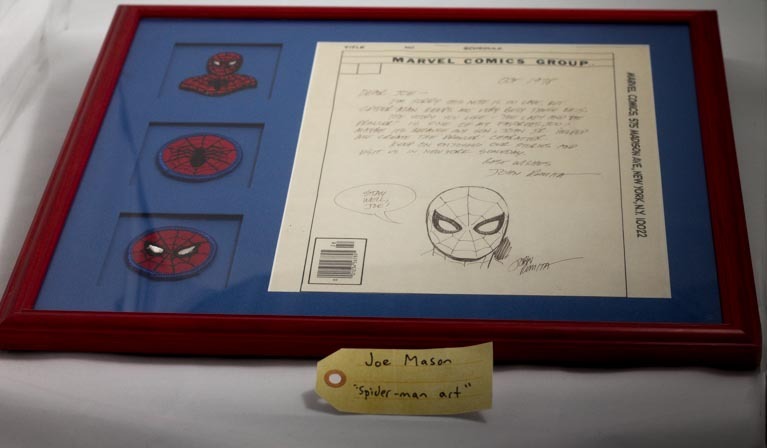 […] She said, ‘Tell you what, Joey, give me a letter, I’ll make sure I get it to Mrs. Romeda, she’ll get it to Johnny, and he’ll send you back a letter.’ […] One day in the mail I got the letter from John Romeda, with original Spider-Man art done on the Marvel Comics stationary.